Have you ever tried to identify the best voice in a barbershop quartet? How about in a choir? If there are only three or four people singing, it isn’t terribly difficult to pick out the individual voices. Once that number of singers swells to 20—or even 200—it gets a little more difficult to separate the Brian Wilsons from the David Hasselhoffs. This exact conundrum describes the climate in which brands currently vie for attention. Most Americans are exposed to a cacophonous 4,000 to 10,000 advertisements each day, and if brands aren’t strategic, their marketing messages will only blend into this ever-growing choir of noise. Nowadays, brands need to find innovative opportunities to grab the spotlight, quiet the choir, and take a rousing vocal solo. The traditional marketing cocktail of TV commercials, pop-up ads, and tweets just doesn’t get the job done anymore. Twenty-five percent of all American households have cut the cord and stopped watching live television, and the remaining 75 percent are increasingly recording their favorite shows and skipping the ads. Digital ads are losing their kick because nearly 70 million Americans are using an ad blocker, which represents a 34.4 percent spike from 2015. And worse, in 2017, the number of ad-blocking Americans is expected to jump to nearly 90 million. Social media marketing is being similarly watered down. It turns out that likes and follows might not mean as much as we once thought they did. In fact, according to a recent Advertising Age survey, just 11.5 percent of marketers say social media has actually made a positive, quantifiable impact on their brands. In 2017, the most successful marketers will be those who can mute competing messages without consumers even realizing it. This will be a year to experiment with platforms and tactics that reach audiences on their terms—when they’re open to receiving unscheduled messages from brands. Experiential marketing is the noise-cancelling headphone of today’s loud marketing world—and brands are beginning to take notice. Event marketing budgets rose nine percent in the third quarter of this year, and 77 percent of marketers say it has become a vital part of their brand’s strategy. Live events capture consumers’ undivided attention and immerse them in a brand’s message, providing a level of in-person engagement you simply can’t replicate through other mediums. Your audience will actually thank you for hitting the mute button on all the noise. In fact, 65 percent of consumers said live events led them to a better understanding of a product or service. When crafting a brand-centric event, make sure it seamlessly fits into your audience’s day-to-day life and features fun, hands-on, interactive exhibits that stimulate all five senses. Take your show on the road, set up an event on a crowded street corner, and show consumers what your brand has to offer. In 2017, video will account for 69 percent of all consumer internet traffic. People just cannot resist that little sideways triangle when it pops up on their computer screen. In fact, when video is prominently featured on a landing page, conversion rates can go up by a whopping 80 percent. With those numbers in mind, it makes sense that video is one of the fastest-expanding content areas on the internet. This medium provides a great opportunity for brands to showcase their unique personalities and have a little fun. A multipronged approach to video will drive the most engagement. Next year, publish a healthy combination of product explainers, vlogs, and user-created testimonial content in which real-life people tout the life-changing benefits of your products. To paraphrase Dale Carnegie: A person’s name is the sweetest and most important sound in any language. So what’s in a name? Coke answered this Shakespearian question in 2016 when it put names and phrases on the side of its cans and bottles. The idea was that by letting customers select personalized cans, the soft drink company was encouraging a deeper, more meaningful type of purchase—and it worked. Sales quickly improved following the campaign’s introduction. Of the organizations that did not embrace personalization in 2016, 55 percent of them plan to do so in 2017. If you’re one of those brands, consider personalizing your shipping packages, creating crowdsourced brainstorming sessions (similar to how Ben and Jerry’s asks consumers to pick its next flavor), or simply emphasizing to your customer service staff the importance of addressing customers by name and showing them you recognize their individuality. In 2017, data and analytics will be more important than ever to your campaigns. As you experiment with alternate platforms in an effort to better reach consumers, data will grant you the ability to identify, hone, and invest in techniques that create the strongest connections. This is exactly why modern marketing departments currently devote more than 11 percent of their overall budgets to analytics alone. In today’s digital era, every campaign you create—even the experiential ones—can produce a treasure trove of data that helps you improve. Insights from your website, blog, email newsletter, and social media pages can all be transformed into concrete takeaways that help inform your future marketing endeavors. 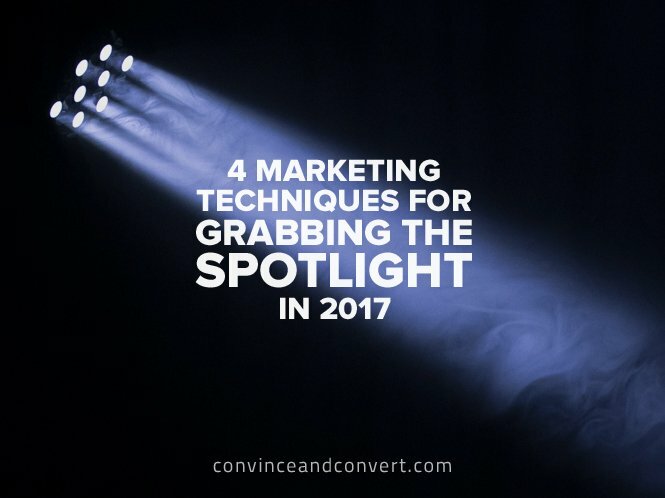 The marketing world is only getting louder, and in 2017, you’re not going to win if your strategy involves trying to out-scream your competitors. Instead, dabble in different tactics that isolate your audience’s attention, and use data to learn and adjust along the way. Sing a song consumers want to hear, and they’ll fall crazy in love with your brand.